Guy Menzies completed the first solo crossing of the Tasman Sea on January 1931. 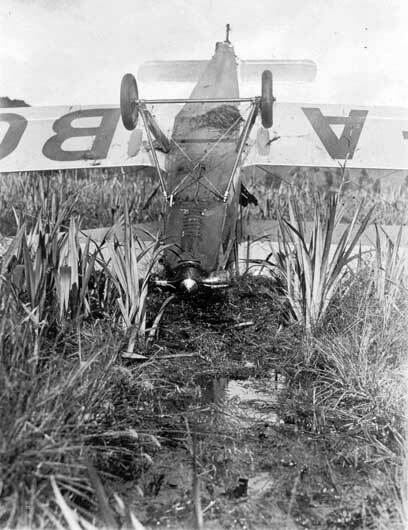 He landed his single engine Avro Avian plane, Southern Cross Junior, in the La Fontaine swamp near Harihari, mistaking it for a grassy paddock. The plane tipped over, an ignominious end to a record-breaking flight. Initially, local residents refused to believe that he had flown across the Tasman Sea, and were only convinced when he produced a sandwich bag from Sydney airport. The landing spot near Harihari is marked by a memorial. The swamp has been drained, and now actually is a grassy paddock.